Are you looking for a good collagen cream for getting its skincare benefits? Collagen is a very beneficial ingredient for the skin as it gives you a glowing skin without any fine lines or wrinkles. Collagen also has a lot of anti-aging benefits. While some amount of collagen is naturally produced by the skin, its production declines with age. Using a collagen cream can help supplement the skin with all the required collagen to get multiple benefits. One of the most popular facial moisturizers from St. Ives, this collagen and elastin cream is specially formulated for dry skin and is available in three sizes to choose from. It is made with 100% natural safflower seed oil which acts as a hydrating agent for the skin and enhances its radiance. Regular use helps to reduce fine lines and dryness also. The formula has a soothing scent and is free of parabens. The price is also very affordable as compared to the quantity. The cream is made up of safflower oil with collagen and elastin for hydrating the skin. You can choose between three sizes and the jar packaging is quite convenient. Regular use helps to enhance the radiance of the skin and makes it supple. The affordable price and the quantity of the cream make it a good investment. The cream does not contain SPF so you need to apply sunscreen separately. The formula takes some time to get absorbed into the skin. This moisturizer from St. Ives is very helpful in treating dryness and improving the texture of the skin. It fights signs of aging and has a very smooth texture which does not leave the face shiny or greasy. Made with marine collagen, this cream from Thalgo comes in a very attractive packaging and is designed to soothe and hydrate the skin. The cream is good for women above the age of 25 as it targets signs of aging and improves the radiance of the skin. It is suited for all skin types and has a very pleasant fragrance which lingers on the skin. Regular use helps to improve the texture of the skin and repair any skin concerns. The price of the cream is higher than most other collagen creams available in the market. The packaging of the cream is quite luxurious and the quantity is good. It is made up of marine collagen which fills fine lines and wrinkles effectively. The fragrance of the product is very pleasant. The texture of the cream absorbs well into the skin and leaves it supple and soft. The price of the cream is very high as compared to other creams. The glass jar is not very travel-friendly and poses the risk of breakage. This marine collagen cream from Thalgo works wonders on signs of aging and reduces dryness and signs of aging from the first use itself. The luxurious formula and the glass jar make your skin feel pampered. Korean skincare products are known for their efficacy and this collagen cream from Etude House is popular for its deeply nourishing formula. It has a thick consistency and is more suited for people with a very dry skin. The cream comes in a convenient and lightweight plastic jar packaging and the quantity is very good as compared to the affordable price. The consistency of the cream is heavy so it takes some time to get absorbed into the skin but it leaves the skin very soft and radiant. The price is very affordable as well. The cream contains hydrolyzed collagen which gets absorbed easily into the skin. The plastic jar packaging is lightweight and travel-friendly. The thick formula is suitable for very dry skin and acts as a good night cream. The price of the cream is quite affordable as compared to its quantity. The formula might feel a bit greasy on the skin if not massaged properly. It can lead to breakouts if used on oily skin. Etude House is a Korean skincare brand and this deep collagen cream is specially designed for treating dry and patchy skin and improving its texture. Regular use makes the skin feel very supple and glowing. Designed to restore the suppleness of the skin, this face moisturizer from L’Oreal Paris comes in a pack of two. It has a non-comedogenic formula and is quite light on the skin. The cream is designed to be used as both day and night cream and it is suitable for all skin types. It comes in a bulky glass jar packaging which can be a bit difficult to handle. Regular use helps to reduce uneven skin tone and dry patches as the natural collagen fills the fine lines and spots. The price of the cream is moderate and you can also buy a single pack. The cream uses natural collagen to repair the skin and improve its texture. The non-comedogenic and lightweight formula does not cause any breakouts. You can choose between a single pack and pack of two. It can be used as both day and night cream for getting better results. The cream might be too light for people with dry skin. The bulky glass jar packaging makes it less travel-friendly. This collagen cream from L’Oreal Paris is great for people who are looking for a lightweight and hydrating moisturizer with collagen. It enhances the radiance of the skin and makes it look youthful. Made with 100% collagen, this cream is available in two variants. It firms up the skin with regular use and works wonders on dry spots and patchiness. The formula is good for combination to oily skin types and hydrates the skin well. It has a delicate fragrance which does not irritate the skin. It absorbs well into the skin and does not cause any breakouts. The packaging of the cream is convenient and travel-friendly. The price is reasonable as compared to its results and quantity. The cream contains 100% natural and pure collagen that plumps up the skin. Regular use helps to reduce sagging and sallowness of the skin. It blends well into the skin and does not cause any breakouts. The packaging and quantity of the cream make it worth the price. The cream contains some chemicals which might irritate sensitive skin. The packaging is not very sturdy or luxurious. Mason Natural is a very gentle skincare brand and this collagen cream is designed to supplement the skin with natural collagen without disturbing the delicate pH balance. One of the very few collagen creams that can be used as night creams, this cream contains rose hip oil, pomegranate extracts, and vitamins A, C, and E. It is also a good anti-aging cream as it contains Dead Sea minerals which are known to be very beneficial for the skin. The active minerals soften the skin and iron out the wrinkles that might have developed due to the stress. The price of the cream is a little high as compared to its quantity. The cream contains active dead sea minerals which renew the skin cells. The Omega-3 fatty acids slow down the aging process of the skin. The formula can also be used as a night cream. Regular use helps to fight signs of aging and uneven skin tone. The active minerals take some time to show visible results. It has a strong fragrance which might not be preferred by some users. The Dead Sea minerals are very good for the skin and promote healthy skin if applied regularly. This cream contains a potent mixture of natural ingredients with collagen so it shows long-lasting results. 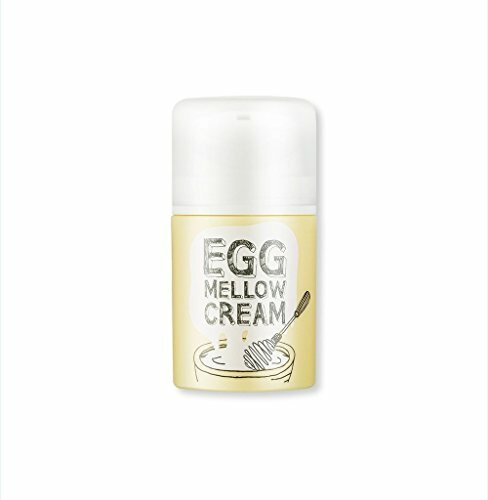 Made with egg yolk, this cream has a hypoallergenic and cruelty-free formula that is designed to provide an instant lift to the skin. It comes in a very cute pump packaging and contains 98% pure collagen which improves the elasticity of the skin. The quantity of the cream is good as one bottle lasts for 2-3 months if used daily. The formula is quite light and has a fragrance which is neither too strong nor too mild. The price of the cream is moderate. Egg yolk helps to combat dark uneven spots and restore the elasticity of the skin. The cream provides an instant lift to the skin and makes it look radiant. The convenient pump packaging is easy to use and is travel-friendly as well. It contains 98% pure collagen that makes the skin look plump and healthy. The smell of the cream might bother people who do not like egg. The packaging does not allow the user to see how much product is left in the tube. This is another Korean skincare product which is very good for all skin types and contains pure collagen that benefits the skin in multiple ways. The convenient packaging and the soothing formula work well for travel as well. With 8 different sizes and 7 styles to choose from, the Pond’s anti-aging cream contains collagen as well as alpha-hydroxy acids which reduce wrinkles and give visible results in just a few weeks of usage. The cream is suitable for daily use and works on enlarged pores as well as dullness of the skin. The formula also contains vitamin E which rejuvenates the skin and makes it look glowing. Regular use diminishes acne scars as well. The price of the cream is reasonable and the packaging is also handy. You can choose between different sizes and variants to find the right cream for your skin type. Alpha-hydroxy acids help in cell renewal and collagen reduces signs of aging. The plastic jar packaging is lightweight and the quantity is good for the price. The cream has a soothing texture and is reduces acne scars is used regularly. The cream contains parabens which can be harmful for the skin. The formula might cause breakouts if more product is used than required. This is one of the most popular skincare brands and the collagen face cream works well if you are looking for a more radiant and soft skin. It offers a lot of options in terms of sizes and variants also. 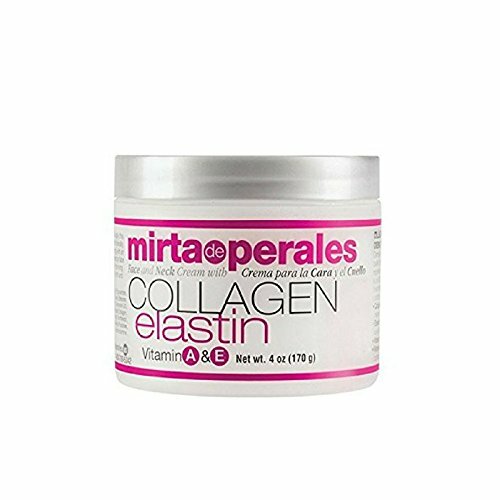 Made with collagen and elastin along with a few essential vitamins, the Mirta De Perales cream offers three size options to choose from and is suitable for all skin types including sensitive skin. It improves the elasticity of the skin and reduces dullness and fine lines effectively. The formula of the cream is a bit thick and takes some time to get absorbed into the skin. The cream can also be used for the under eye area. The quantity and the jar packaging make the cream worth the price. Collagen and elastin lift the skin and reduce dullness with regular use. The formula of the cream is good for all skin types. It makes the skin feel soft and supple instantly. The price of the cream is affordable when compared to the quantity. The cream needs to be massaged into the skin for better results. The smell of the cream is not very pleasant and can irritate some users. This is a good option to consider if you want multiple benefits from one skin care cream as this cream not only fights signs of aging but also nourishes the skin well. The formula is suitable for all skin types and is quite soothing on the skin. Formulated without parabens and mineral oil, this night cream contains collagen and a unique hydrating agent that adapts to your skin type. It not only hydrates the skin but also reduces moisture loss so it keeps the skin feeling soft and supple. The cream comes in a luxurious jar packaging but the quantity is a little less than the other creams available in the market. The formula is very soft and smooth on the skin and does not make the skin feel greasy. The price is a bit high. The formula contains a unique moisturizing complex that prevents moisture loss and hydrates the skin well. It is formulated without parabens, mineral oil, and other harmful chemicals. The luxurious jar packaging looks stylish and is travel-friendly. The cream feels very soft on the skin and does not irritate or cause redness. The price of the cream is a bit higher than other collagen creams. It does not work effectively on mature skin which needs a bit stronger formula. This cream uses hydrolyzed collagen to restore and repair the skin’s health and prevents moisture loss effectively. It is a bit expensive but is great for people who are looking for paraben-free alternatives. While all these creams contain collagen as the main ingredient, it is the type of collagen which matters. Some creams contain hydrolyzed collagen while some contain marine collagen. Both these types of collagen have different benefits and act on the skin differently. Stay away from creams which contain a lot of chemicals and have very little collagen percentage in the formula. The formula of the cream should be neither too thick nor too thin. It should be soothing on the skin and should get absorbed easily leaving behind a soft and supple skin without any greasiness. People with mature and aging skin should go for creams which provide anti-aging benefits and people in their 20s-30s can go for creams which provide hydration. Check your skin type before purchasing a collagen cream to make sure that it answers your skin concerns and is right for your particular skin type. Do not go for heavily perfumed creams if you have a sensitive skin. You can get a good collagen cream in around 15$ – 30$ and it is advisable to invest in a good-quality cream which contains more natural ingredients and fewer chemicals in it. Do not go for creams which do not contain a good percentage of collagen as they do not provide the same benefits. Always check for customer reviews before purchasing a skin care product but read these reviews with a pinch of salt as all skincare products work differently on every person. These customer reviews will help you get an idea of how the cream works for your skin type. Always wear a sunscreen after applying a collagen cream to protect your skin from the sun and get more benefits. Do not use creams which contain synthetic collagen or a smaller percentage of collagen as these creams are not very effective on the skin. Massage the cream properly into the skin to get the maximum benefits of collagen as this ingredient needs to get absorbed into the skin to work on the deeper layers. Collagen creams are more effective as night creams as compared to day creams as your skin is more receptive at night and collagen helps in cell renewal. Clean your skin well before using a collagen cream to get better results as makeup hinders with the absorption of the cream. Keep the cream away from sunlight and keep the jar closed at all times when not in use to maintain the potency of the formula. So these were the ten best collagen creams available in the market which are made with pure hydrolyzed and marine collagen which provides anti-aging benefits and makes the skin look radiant. Regular use of these creams reduces dullness and fine lines as well. This detailed buyer guide along with these useful tips will help you get all the benefits of these creams regardless of your skin type and concern. Including this cream in your skincare routine will help you get a flawless skin in just a few weeks. Have you used a collagen cream to restore your skin’s elasticity and radiance? How was your experience? Is it possible if I use a collagen day cream together with moisturizer? Of course. You can use both collagen day cream and moisturizer together. In fact, you should use a day moisturizer in daily and don’t forget to drink water at least half of your weight. So, your skin will be kept hydrated all the time. I’m over 30. I start to have sign of aging and using collagen creams but I want to know more what can cause skin aging? Stress is one of the factors that cause skin aging which the body react to it by releasing hormones, cortisol. It can be said that stress is a silent treat to the sign of aging that influence the breakdown of collagen. Thalgo Collagen Cream is my best choice.